Did you know that dentists recommend you spend 2 minutes every time you brush your teeth, with 30 seconds devoted to each quadrant of your mouth? Did you know you’re supposed to brush at least twice a day (three times is better), or that you should change your toothbrush every 3 to 4 months? Thankfully, this is 2013 – we don’t need to know this stuff anymore because there’s an app available to know it for us. 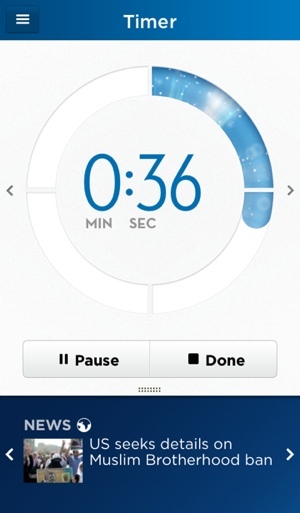 Toothbrush maker Oral-B has just unveiled a new iPhone app to help you keep track of your brushing. And best of all, it syncs with the company’s power toothbrush line. The app does more than just watch you brush, of course. A timer starts when the app hears you turn on a power toothbrush to keep track of how long you’ve been cleaning (though you can also start the timer manually). The app will keep long-term statistics, alert you when it’s time for a new brush and even do its best to keep you entertained while brushing by offering weather forecasts and news. Okay, yes, it’s a little ridiculous that something as boring as brushing your teeth has an app associated with it. But a tiny bit of toothbrush technology might help encourage your kids to brush. After all, if the lure of technology and constant distraction aren’t enough to get your kids to put in the required 4 minutes per day, what will? The Oral-B app is a free download on the Apple App Store.